Katherine Zappone arriving at the Central Criminal Court today. 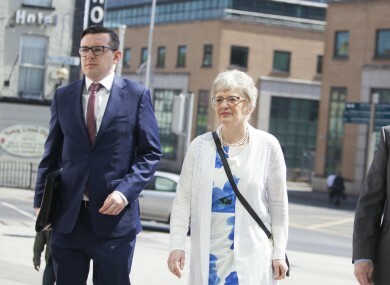 MINISTER FOR CHILDREN Katherine Zappone has told the trial of seven men charged with falsely imprisoning Joan Burton that she felt Burton and her advisor were in “great danger” during a water charges protest in Jobstown in November 2014. Zappone agreed with Sean Gilanne SC, prosecuting, that she was “very frightened” for the Tánaiste who she felt was “in great danger”. Solidarity TD Paul Murphy (34) along with south Dublin councillors Michael Murphy (53) and Kieran Mahon (39) and four other men have pleaded not guilty to falsely imprisoning Burton and her special advisor Karen O’Connell by restricting their personal liberty without their consent at Fortunestown Road, Jobstown, Tallaght on 15 November 2014. Murphy of Kingswood Heights, Tallaght, Kieran Mahon of Holbrook Grove, Tallaght, Michael Murphy of Whitechurch Way, Ballyboden, Dublin, Frank Donaghy (71) of Alpine Rise, Tallaght, Ken Purcell (50) of Kiltalown Green, Tallaght, Michael Banks (46) of Brookview Green, Tallaght and Scott Masterson (34) of Carrigmore Drive, Tallaght have denied the charges. Minister Zappone said that she was a independent Senator at the time and was attending the graduation ceremony at An Cosan women’s education centre, of which she was a founding member. On day eight of the trial at Dublin Circuit Criminal Court, she said that during the walk from An Cosan to the nearby Catholic church, protesters crossed the road and “closed in on us, particularly on Joan”. I tried to engage with any of them close to me and said this was a day for their fellow community members. I put my hands up a few times because I felt that people were closing in on us and it was a matter of concern. Zappone said that when she noticed Burton leaving the church she followed her outside. “She was in the car, there was lots surrounding it, banging on the car and chanting, moving the car back and forth. I felt deeply concerned, I was scared for her. I picked up the phone and rang 999 as I didn’t see too many gardai,” she told the court. The Minister said she saw one of the accused Paul Murphy during the time that Burton and O’Connell were detained in the unmarked car. “He was in front of the unmarked car, holding a loudhailer. We had a brief exchange,” she said. During cross-examination by Sean Guerin, who is representing Paul Murphy, Zappone agreed that in principle she did not agree with water charges and regarded it as a regressive model. Zappone agreed with Guerin’s proposition that in public life there are sometimes “tipping points where a historic wrong can be addressed perhaps violently, when people find the ability to voice that wrong and put it right”. Guerin also referred to a pre-election TV debate during which Zappone said she did not condemn “at all” what was going on in Jobstown on November 15, 2014 in response to a question from an audience member. After the court viewed the tape Guerin asked Zappone if her position was any different today. She said that her judgement was that what happened to Burton was menacing and deeply concerning and intimidating. “I was deeply concerned about what could happen to Burton and O’Connell. I put out a statement which says pretty much the same thing,” she replied. “So when in the company of voters and when on TV you won’t condemn the protest but you are happy to quietly issue a statement?” Guerin asked. “I think I’ve offered my view,” Zappone responded. Email “Children's Minister says she believed Joan Burton was in 'great danger' during protest, court hears”. Feedback on “Children's Minister says she believed Joan Burton was in 'great danger' during protest, court hears”.